Myofascial Trigger Points (MTrPs) are frequently overlooked or misunderstood as a source of musculoskeletal pain. Our webinar series will give you the necessary tools to identify the source of—and successfully treat—myofascial pain and its concomitant motor and autonomic dysfunction. The Myofascial Trigger Point Therapy Treatment Protocol will enhance the way you practice by providing you with the insights, procedures, and efficacy you’ve been looking for. Victoria L Magown graduated as a Myotherapist and Fitness Instructor from the Bonnie Prudden School of Physical Fitness and Myotherapy in 1983. In 1984, Victoria opened the NM Myotherapy and Exercise Clinic in Albuquerque, NM, and helped establish the National Association of Myofascial Trigger Point Therapists. She has held almost every position on the board during the ensuing years. In 1997, Victoria and partner George S. Pellegrino established the American Institute For Myofascial Studies (AIMS) and its popular MyoRehab Seminar Series. In 1994 Victoria founded MyoRehab, which is still going strong today. This two-hour Fascia Webinar gives you up-to-date information about the function and treatment of Fascia. It includes the latest information about Fascia from the original researchers in Italy; Luigi, Carla and Antonio Stecco and Robert Schleip from Ulm University in Germany. 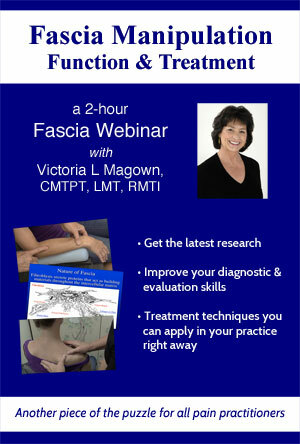 This Fascia Manipulation Webinar will make a profound difference in your diagnosis, evaluation and treatment of pain patients.